Willie and I spent a weekend in the Yosemite high country taking photos of the Milky Way, beautiful lakes, and meteor showers. During the day we explored Yosemite while at night we spent most of our time at Mono Lake. 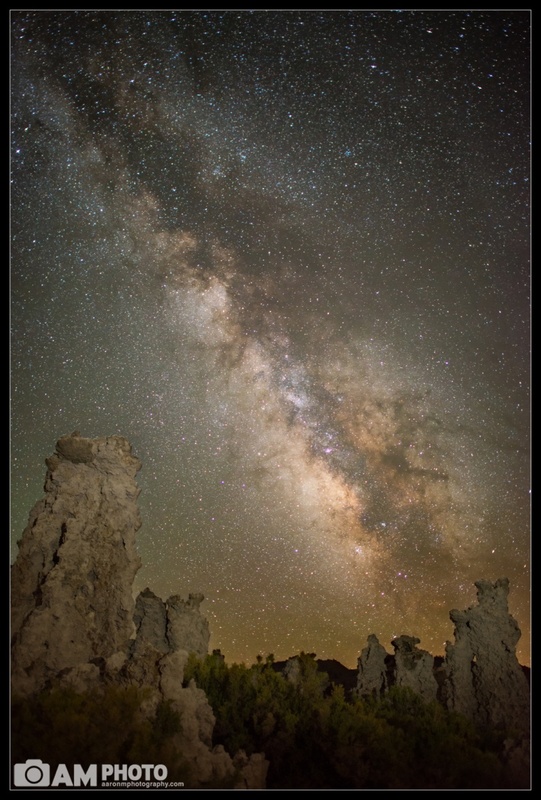 One evening, we noticed that the Milky Way was setting directly behind us at the lake, over a couple sets of Tufa’s and we just had to turn around and photograph it. There wasn’t enough moonlight to light up the Tufa’s so Willie grabbed a couple flashlights and light painted the Tufa’s. We repeated the light painting several times until we got it right. Tufa’s are salt creations left behind as Mono Lake was drained for drinking water for the Southern California region. Conservation efforts are under way and the lake level is rising again, hiding some of the Tufa’s that have recently been visible. We wanted to capture as many photos as we could before these are back underwater! I debated whether or not to post this photo as I really wish there had been some of Mono Lake in this shot, but ultimately, I really liked how the Milky Way almost looks like a shooting star above the Tufa’s. The following night was the peak of the Perseid Meteor Shower and Willie and I captured a number of meteors streaking through the sky! I also really liked how this photo almost looks like it could be taken from another planet — perhaps Mars?